Fonts must be rendered in order for remote applications to function properly. Remote applications access fonts available from X-Win32 on the Windows side., not the remote host where the application resides. X-Win32 ships with the most typical fonts needed by almost all applications. Usually no new fonts need to be installed. However, in certain circumstances, a specific application may use a custom fontset which X-Win32 does not supply. In this instanceX-Win32 provides the ability to add extra fonts to remote applications through a font path. If the fonts needed are located on the local Windows machine, press the Folder button to add the folder where these fonts reside. The font folder must have a fonts.dir file and the fonts should be in .pcf.gz or .bdf formats. For fonts located on remote systems, X-Win32 can connect to a font server. This font server must be up and running for X-Win32 to connect to it. Press the Server button and put in the host name or IP address of where the font server resides. Optionally change the port number if your server is not using the standard port. Highlight a font path and press the Edit button to change the location of the path. If it is a font server, you can change the hostname or IP Address. If you have added custom font directories to the font path you may want X-Win32 to choose them first. Highlight a specific directory and use the UP and DOWN arrows to move the directory in the list. Directories at the top of the list are chosen first. 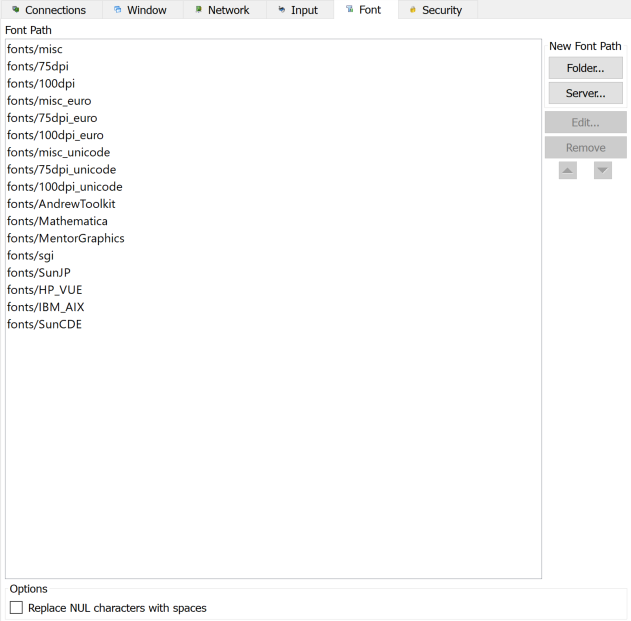 NOTE: Font servers should always be placed at the bottom of the list as a remote connection is needed to access the fonts. Fonts from font servers will generally take longer to render than fonts located on the Windows machine, thus slowing down productivity. Highlight the font directory and press the Remove button to remove the directory from the list. NUL characters by default have no corresponding glyph (rendered font), and thus can appear as any character, usually an empty box. Check this box to force a NUL character to be rendered as a blank space.